If you’ve ever see the movie The Monster Club you’re no doubt aware what a monster’s genealogical chart is, and how it fits into the movie. 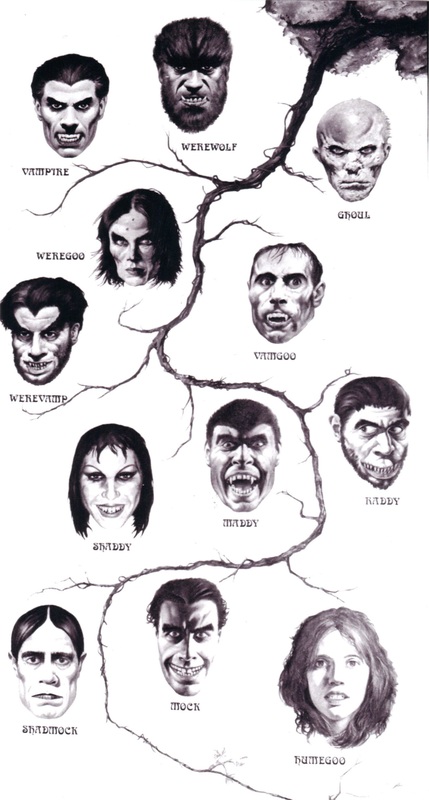 But if you haven’t, here’s a monster’s genealogical chart. If you watch the movie, one of my all time favorites, Vincent Price will gladly explain to you the various monster species and how interbreeding of monsters, and sometimes humans, creates a vast array of new monsters with different looks and powers. My favorite is the Shadmock. He only whistles. This chart was created by artist John Bolton, and I have been trying to buy the original now for five years. I came very close at one point when I contacted Bolton’s wife and assistant, and she told me she had discovered it in the basement months before and sold it to a collector. I didn’t even ask for how much because I’m sure it would have broken my heart, but at least I know it exists. The scan you are now looking at comes from an Ebay item I bought which the seller claims to have obtained legally. Aside from this it’s very, very difficult to find a clear scan of this work. Recently I saw someone had spent a great deal of time and effort making this into a full-size poster on vellum. I nearly bought it, but still hold out hope the original will find its way to me someday. This entry was posted on May 2, 2015 at 6:08 am and is filed under Uncategorized. You can follow any responses to this entry through the RSS 2.0 feed. You can leave a response, or trackback from your own site. Reblogged this on The Monster Club.